Japan’s submarine construction programme eventually produced the single most extraordinary class of boats conceived by any of the combatant navies of the Second World War. 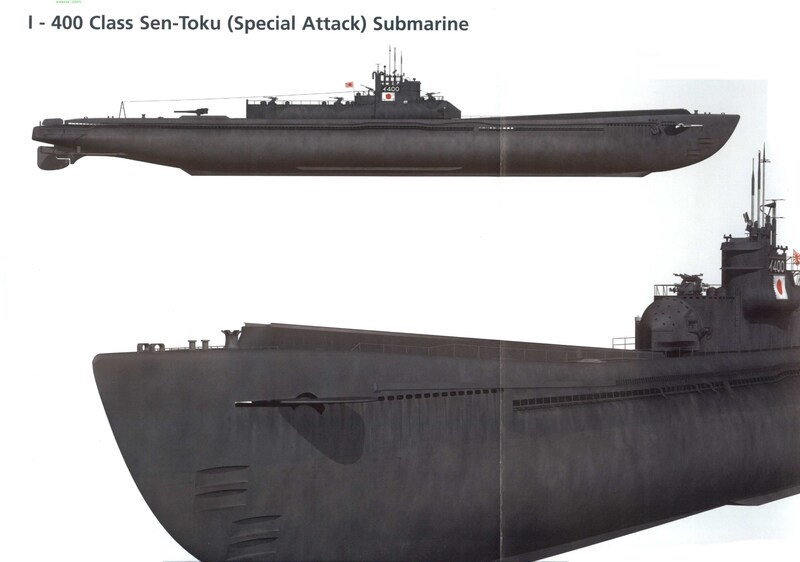 The I-400-class submarines were created in order to take Fujita’s original plan to attack the United States on home ground to a devastating conclusion. Fujita’s plan was dusted off, read again and evaluated, and the problems of the September 1942 missions over the forests of Oregon analysed. Solutions were sought to make any future attacks a success. As early as April 1942 the Imperial Navy had decided to order the construction of a class of submarine that would dwarf previous Japanese creations in order to provide a far-reaching strike capacity. The problems with Fujita’s original concept were obvious and based around the equipment the Japanese had utilized when making the attacks. The Yokosuka E14Y1 floatplane was not a dedicated bomber, but a reconnaissance plane that could be used as a bomber, capable of carrying a tiny munitions payload. The bomb load was pathetically small, and getting the aircraft in range of a ground target was largely a waste of naval resources. The aircraft was also ponderously slow, with a cruising speed of only 90 miles per hour, which although making it an ideal reconnaissance platform, also made it very vulnerable to anti-aircraft fire and enemy fighters. The E14Y1 was also virtually defenceless, armed with a single rear firing 7.7mm machine gun, so if it had encountered an enemy fighter it would in all probability have been shot down with ease. The submarines that were fitted with the E14Y1, such as the I-25, were only able to store a single aircraft inside their waterproof hangar. The only conceivable way the Japanese could have mounted a sizeable raid with these little planes would have been by gathering several submarines together off the American coast, which in itself was a waste of the submarines’ own fighting potential as they waited around for the return of their aircraft, and exposed the boats to the risk of aerial and ship attacks. The answer to all of these problems was a single submarine large enough to both reach land targets in the United States without requiring any refuelling, and able to carry more than one aircraft. The new bombers would have to be potent weapons, able to deliver a large payload of bombs, but still retaining the floatplane characteristics enabling their operation at sea from submarines. In effect, the Japanese Navy required a submarine aircraft carrier, and this is exactly what they set about designing and constructing between April 1942 and December 1944. Each I-400-class vessel was a monster, the largest submarines built until well into the post-war nuclear age, their size only surpassed in 1962 when the Americans commissioned the USS Lafayette. Displacing 5,223-tons surfaced, each boat was 400.3 feet in length with a beam of 39.3 feet and was powered by four diesel engines and electric motors. Atop the weather deck was a 115 feet long waterproof hanger, twelve feet wide, big enough for three specially designed torpedo bombers. In front of the hangar, bolted to the immense deck stretched a pneumatic aircraft-launching catapult eighty-five feet long, and alongside this a powerful hydraulic crane for recovering the aircraft from the sea. Through the Yanagi underwater trade in weapons and new technologies conducted between Nazi Germany and the Japanese, the Imperial Navy had copied the snorkel technology fitted to late-war U-boats, and these were fitted to all four I-400-class submarines. The snorkel mast, when extended above the surface of the water as the submarine cruised at periscope depth, enabled the boat to run on its diesel engines instead of batteries, producing a greatly increased underwater speed and protection from aerial detection and attack. Hugely capacious fuel tanks on each boat meant that each of these submarine aircraft carriers was capable of cruising an astounding 35,500 nautical miles at 14 knots before the tanks ran dry, in other words giving the Japanese skipper the ability to circumnavigate the globe one and a half times. 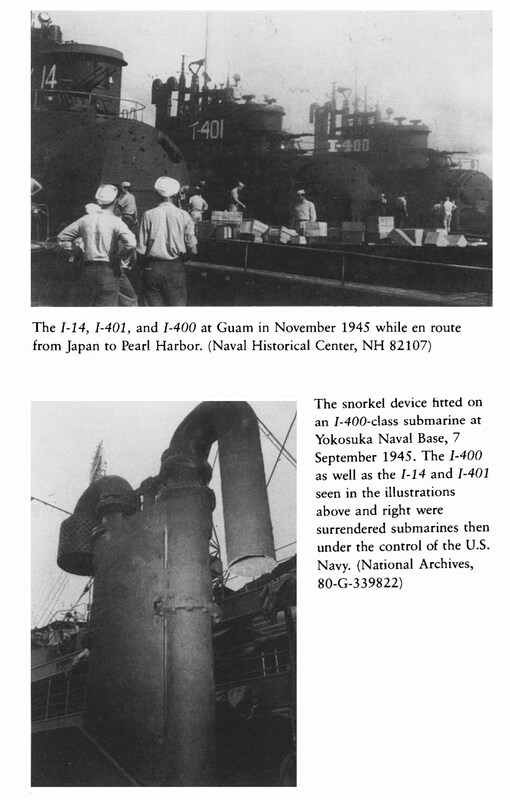 The huge range of these vessels meant that for the first time in the war the Japanese Navy had a machine capable of not only crossing the Pacific to attack the west coast of the United States, but also, in theory, of crossing into the Atlantic via Cape Horn and unleashing air strikes against New York or Washington DC, and both cities were later seriously considered by naval planners in Tokyo for attacks. The I-400-class submarines were capable of a top surface or submerged snorkel speed of 18.7 knots, or if fully submerged and running on electric motors 6.5 knots. Radar and radar detectors, though not up to the German standard, were fitted to all four boats of the class. Although submarine aircraft carriers the I-400-class boats were more than capable of fighting like any other submarine types, having eight torpedo tubes (and twenty torpedoes) and an improved 140mm 50 calibre deck-gun. Improved anti-aircraft defences increased each boat’s chances of standing off an aerial assault, with a 25mm cannon mounted on the conning tower, and three triple barrelled 25mm cannon located on top of the aircraft hangar, giving a total of ten guns. With a maximum diving depth of almost 330 feet, each boat took slightly under one minute to crash-dive. Such superb and powerful vessels required an equally superb and capable aircraft type, and here the Japanese also excelled. 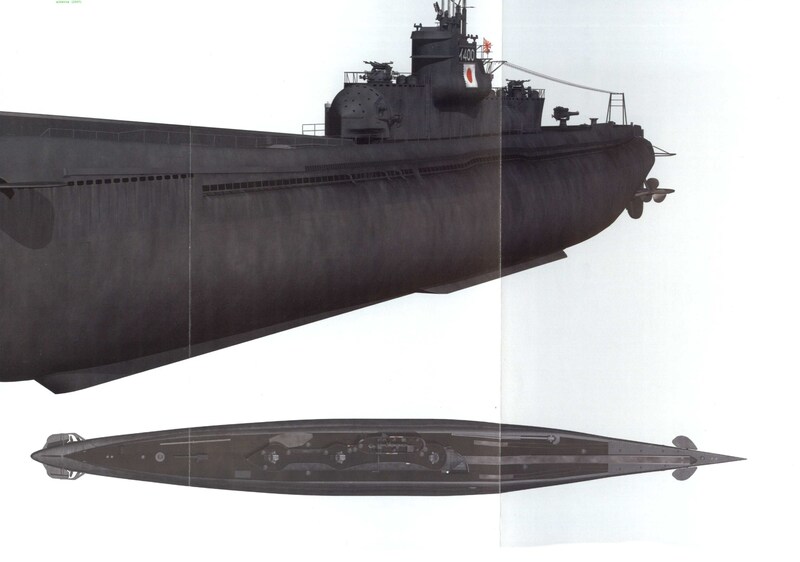 Each I-400-class submarine was designed to carry a maximum of three Aichi M6A1 Seiran torpedo bombers. Seiran can be translated as ‘Storm from the sky’, and these aircraft were no ponderous reconnaissance types but sturdy birds of destruction. Still floatplanes, each monoplane measured thirty-five feet in length, with a wingspan of forty feet. Designed by Toshio Ozaki, chief engineer at Aichi, the Seiran had to conform to a series of guidelines laid down by the Imperial Navy as they sought the perfect plane for their new submarines. In late 1942 Ozaki began developing the aircraft that the navy specified must have been capable of carrying a maximum bomb load consisting of a single 1,288-lb (800kg) aerial bomb or torpedo. In the light of the desperate position Japan was in by late 1944, if a kamikaze mission was called for the floats could be detached and the fuel and bomb load increased for a one-way mission against the enemy. The navy also stipulated that the aircraft must be capable of a top speed of 294 miles per hour with floats, or 347 miles per hour with the floats detached. Under normal, non-kamikaze, operating conditions each Seiran had a range of 654 miles, which meant that the ‘mother’ submarine could sit some way off from the enemy shore when launching and recovering its air group, instead of having to come close inshore to launch and then sit vulnerably on the surface awaiting an aircraft’s return from its sortie. The first prototype Seiran was completed in October 1943, and several others followed. The navy, however, was overjoyed with the performance of the prototype aircraft and ordered full production before testing had been completed at Aichi in early 1944. This decision was probably hastened by the deteriorating Japanese naval situation, and the necessity of getting the new submarines and aircraft into action as soon as possible. This was to prove to be no easy task as American bombing raids and even an earthquake, which completely shut down production at Aichi by March 1945, hampered production of the aircraft. 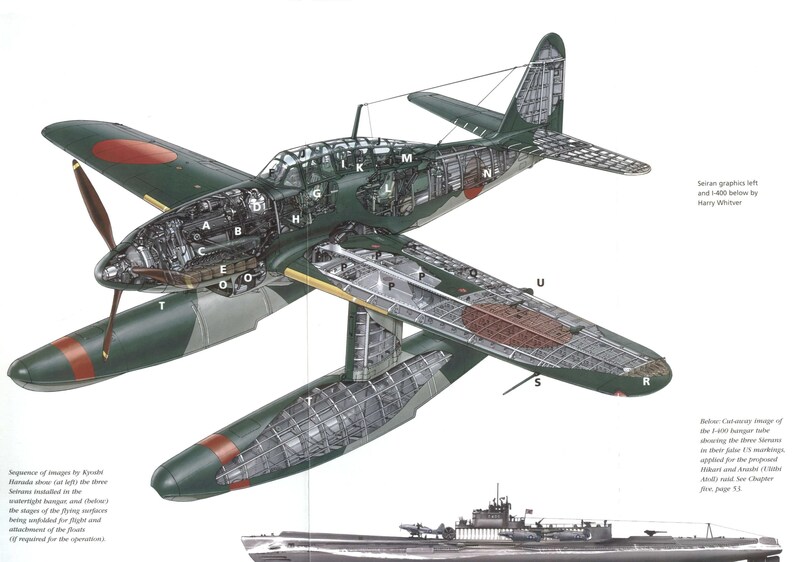 In the end Aichi engineers managed to cobble together twenty-six Seiran torpedo bombers (including prototypes) and a pair of land-based trainers, the M6A1-K Nanzan. The navy no longer required a large number of Seiran aircraft as they had been forced by the weakening of Japan’s economy to scale back the number of I-400-class submarines under construction. The I-400 was ready for service on 30 December 1944, and the I-401 followed a few days later. I-402’s duties were changed from being an underwater aircraft carrier, and instead she was refitted as a submarine fuel tanker. Two other boats, I-404 and I-405 were abandoned on the slips and not completed before the Japanese surrender. Although each I-400-class submarine’s complement was listed officially as 145 men, on operations up to 220 crewmen were carried aboard in order to make the dispatching and recovering of the aircraft as efficient an operation as possible. The Seiran aircraft were stored inside the huge hangar with their floats detached, and their wings and tails folded up. Each well-trained team of aircraft technicians and mechanics could assemble a single aircraft in around seven minutes, ready for launching. All three torpedo bombers could be assembled, fuelled and fitted with either torpedoes or aerial bombs, attached to the launching ramp and catapulted away in about forty-five minutes (close enough to the original Japanese Navy stipulation of thirty minutes). In order to maintain the air group while the submarine was at sea a special compartment was located inside the pressure hull beneath the hangar where engineers could test aircraft engines and maintain the airframes. Beside this was the aircraft magazine, containing four aerial torpedoes, fifteen bombs and ammunition for the aircraft’s cannon and machine guns. The I-400 and I-401 were placed into a new unit alongside two modified AM-class submarines, the I-13 and I-14. Originally this type of boat had only been capable of carrying a single floatplane, but while under construction in 1944 the Japanese changed their plans and altered the configuration of the AM-class boats to take two of the new Seiran bombers. Although having a range of 21,000 nautical miles at 16 knots, the modifications meant the boats’ underwater performance suffered, making them relatively easy targets for both American aircraft and warships. Under the overall command of Captain Tatsunosuke Ariizumi, the submarines were organized as 1st Submarine Flotilla, with the aircraft and aircrew forming the new 631st Air Corps. The I-13 and I-14 would each carry two aircraft, while the I-400-class pair was loaded with full air groups of three Seiran each. The Japanese Navy now had the most potent collection of submarines yet assembled in war, and what was required now was a plan to use all of this potential against the enemy. The Japanese Army had for years been experimenting with biological warfare at a secret research facility at Harbin in China. In 1936 the army had organized Unit 731 under Colonel Dr Shiro Ishii. The experiments had been conducted on human beings, both Chinese soldiers and civilians and American prisoners captured in the Philippines in 1942, and the results had demonstrated that various lethal bacteria and diseases could be used against civilian populaces, and delivered either by dropping infected insects or rats or delivering the bacteria in special aerial bombs. Tens of thousands died as a result of infected fleas being dropped over wide areas of the Chinese countryside. The Japanese also managed to kill around 1,700 of their own troops when the experiments backfired. At this stage of the war, with Japan clearly losing, some in the navy advocated using the ten aircraft of 1st Submarine Flotilla to drop bubonic plague, cholera, dengue fever, typhus, anthrax or a wide variety of other virulent bacterial agents on the United States in order to create widespread infection and panic among their enemies. A leading advocate of such a strategy was Vice-Admiral Jisaburo Ozawa, then Vice-Chief of the Naval General Staff in Tokyo, who along with others formulated a plan codenamed Operation ‘PX’ to this end. This plan envisaged the dropping of infected fleas into the downtown area of San Francisco from Seiran aircraft, an event that would have killed thousands of Americans. However, there were those in positions of higher command who considered such a plan to be lunacy, and stated this quite emphatically at the time. A leading member of the opposition to ‘PX’ was the army’s most senior officer, General Yoshijiro Umezu. Umezu was Chief of the General Staff, and managed to quash the plan on 26 March 1945 before any move was made to carry it out. This diabolical operation was a massive step on from Fujita’s modest bombing proposals, and even for many Japanese dropping plagues into the enemy camp was going too far. As for Unit 731, when the war ended Ishii and his group of scientists and soldiers were captured by the Americans. Instead of hauling these mass murderers before a war crimes tribunal the Americans struck a deal whereby the members of Unit 731 were granted immunity from prosecution in return for passing their germ warfare data to the Americans. The exigencies of the new Cold War with the Soviet Union meant that the United States was prepared to overlook how this data had been created in order to stay one step ahead of its enemy. Although Operation ‘PX’ was dropped, the Imperial Navy still wanted to launch its ten Seiran aircraft against targets in America, but this time armed with conventional weapons. Various targets were placed before the naval staff, including San Francisco, New York and Washington DC, as well as the Panama Canal, ironically once Fujita’s target of choice. All things being considered, the navy eventually decided that a strike against the Panama Canal would have had the greatest effect on America’s ability to prosecute the war against Japan. The specific target that the Japanese identified as creating the most damage would have been a strike aimed at destroying the Gatun Locks. The Panama Canal is very different from its much longer cousin, the Suez Canal. The Suez Canal remains at sea level for its entire length, whereas the Panama Canal has six sets of locks to raise and lower ships along its course. Water for these locks comes from two artificial lakes, Gatun and Madden. If the lock gates could be breached Gatun Lake would empty itself, making the canal impassable for American shipping for several months and severely disrupting the American build-up in the Pacific. It was reasoned that the ten Seiran torpedo bombers would be able to breach the locks in a determined attack, and it would be the last place the Americans would expect a sudden Japanese aerial assault, so surprise might also have meant encountering little opposition at the target. It was planned that the ten Seirans would attack the Gatun Locks with six aerial torpedoes and four conventional bombs. The trip from Japan to Panama and back again would be 17,000 nautical miles, and the Japanese would require 6,400-tons of diesel fuel for the four submarines. This quantity was not available at the submarine base at Kure in Japan. Therefore, before the plan could be launched an annoying delay ensued as the I-401 was sent to Darien in China to obtain the necessary fuel and transport it back to Japan. The I-401’s cruise across to Manchuria would take her through the. Inland Sea, where the voyage almost ended in disaster. American B-29 Superfortress bombers, as well as flattening Japanese cities in fire raids, had also been busily mining areas of the Inland Sea known to still be used by the remaining surface and submarine forces of the shattered Japanese Navy. The Americans were also, by this stage of the war, able to operate aircraft carriers off the Japanese coast with virtual impunity. On 19 March 1945 Vice-Admiral Marc Mitscher led his Task Force 5811 on a devastating attack on the Kure Naval Arsenal. Over 240 American carrier planes bombed and strafed the remains of the once great Imperial Navy. As well as the huge I-400-class submarines drawn up in dry-docks, the I-13 was in the harbour and narrowly escaped damage. The Japanese battleships Yamato, Haruna, Hyuga and he were all bombed and strafed, as well as Japan’s remaining aircraft carriers Kaiyo, Amagi, Ryuho and Katsuragi. It was onto an American aerial mine that the I-401 bumped on 12 April off Hime Shima Lighthouse in the Inland Sea, and although the damage she sustained was not terminal, the vessel had to head back to Kure for repairs. In her stead the I-400 was sent across to Darien and managed to secure the necessary fuel and transport it safely back to Japan. With the acquisition of the fuel, and the return to service of the I-401 following hasty repairs, the stage looked set for the attack on the Panama Canal. The Japanese now decided to carefully train for the proposed operation, constructing a life-size replica of the Gatun Lock gates in Toyama Bay so that the Seiran pilots could make dummy attack runs. The training period was fraught with dangers for the submarines and aircraft as the Americans had, by this stage, almost complete mastery of the air over the Home Islands and American submarines lurked close inshore sinking any remaining merchant ships with impunity. Mines dropped by B-29s littered the sea routes, and the I-401’s recent collision with one demonstrated how vulnerable Japanese submarines had become, a situation being faced at the same time by German U-boats attempting to train crews and work up their new Type XXI and XXIII electro-boats in Baltic waters, heavily mined by the RAF. Captain Ariizumi watched his squadron preparing for the forthcoming attack and he grew increasingly confident that the strike would be a success as the pilots laboured to accurately hit the mocked-up lock gates time and time again. However bold and far-reaching a strike the Panama Canal raid would have been, it was events closer to home that diverted the Japanese High Command’s attention, and made them change the focus of the 1st Submarine Flotilla attack. Panama was a long way away in the minds of many Japanese strategists, who examined their maps with growing anxiety as they watched thousands of American and British ships congregating close to the Home Islands in preparation for the projected invasion of Japan itself. Perhaps the new submarine aircraft carriers would be better employed in attacking the enemy ship concentrations closer to Japan than crossing the Pacific to points distant? Ariizumi was astounded when he was informed that he was to abandon further training for a strike against the Panama Canal, just at the point when he believed his submarines and aircraft were ready to commence the operation, and he was directed instead to take his squadron out against the American anchorage at Ulithi Atoll. The message Ariizumi received from headquarters read: ‘A man does not worry about a fire he sees on the horizon when other flames are licking at his kimono!’ but this did little to placate the squadron commander’s anger and protestations over the change in plan. Headquarters refused to change its mind, and ordered Ariizumi to conduct an air strike against Ulithi in mid-August, necessitating a completely new plan and little time to prepare the boats or the aircrew. This was Operation Hikari, an operation that envisaged six Seirans of 631st Air Corps launching a concerted kamikaze attack on the American anchorage. The I-13 was the first of the new submarines to proceed with the changed operation, moving to Ominato Naval Base on Honshu Island on 4 July. There she was loaded with two crated Nakajima C6N2 Ayagumo reconnaissance aircraft, the planes destined to assist the 631st Air Group pilots with finding targets at Ulithi. Once loaded aboard Commander Ohashi headed directly for the Japanese base at Truk. On 14 July the I-14 took the same route to Truk in preparation for the attack scheduled to commence on 17 August 1945. The I-13 never made it to her destination, as she was intercepted 550 miles east of Yokosuka on the early morning of 16 July by aircraft from the carrier USS Anzio. A Grumman Avenger discovered the submarine on the surface and immediately engaged it with machine-gun fire and 5-inch rockets. The damaged I-13 crash-dived, and the Avenger pilot dropped a Fido homing torpedo in her wake, as well as several depth charges. A further two Avengers arrived at the scene and dropped another homing torpedo into the sea. Later that morning the destroyer USS Lawrence C. Taylor finished off the damaged submarine with a pattern of twenty-four 7.2-inch Hedgehog mortar bombs, killing all 140 Japanese aboard the vessel. Commander Toshio Kusaka aboard the I-400 cruised confidently out of Ominato harbour on 23 July, followed soon after by Lieutenant-Commander Shinsei Nambu and the I-401. Both vessels were travelling on different routes for safety, but planned to rendezvous three weeks hence south-east of Ulithi. The I-14 arrived at Truk on 4 August and unloaded two crated Ayagumo reconnaissance aircraft. The waters around Ulithi were soon to be infested with Japanese submarines carrying Kaiten human torpedoes, excluding the submarine aircraft carriers, as the Imperial Navy bet everything it had on smashing the American fleet anchorage with suicide attacks. The Japanese had modified a torpedo as a suicide weapon and aptly christened it Kaiten (returning to the heavens). Only the Type-1 one-man model fitted with a 3,000-pound warhead was used on operations, the Japanese deploying about 100 in the dying months of the war. It was not a very effective weapon as Allied warships and aircraft easily sank them. The Kaiten only managed to sink two American ships, the USS Mississenewa on 20 November 1944 and the USS Underhill on 24 July 1945. However, the Japanese continued to deploy the Kaiten until the end of the war, a large submarine carrying up to six that could be launched while the boat was submerged. Unfortunately for the Japanese, their huge new I-400-class submarines, and the planes they carried, were in the end destined never to see action. The attack on Ulithi Atoll had been scheduled for 17 August, but as the submarines made their way into position the Japanese government capitulated following the atomic bombings of Hiroshima and Nagasaki and surrendered unconditionally on 15 August. For Captain Ariizumi the news of Japan’s defeat just as his well-trained and committed squadron was about to demonstrate their worth to the navy and the nation was shattering. The Emperor himself had addressed the nation and its armed forces and ordered them all to cease fighting, and none of the submarine captains would go against his word. Naval headquarters in Tokyo ordered all submarines to raise a black flag and return to their home ports on the surface. All that was left for Ariizumi was to empty his vessels of anything the hated Americans might like to examine when they came to take possession of his boats. All sensitive documents, code-books and signalling equipment was pitched over the side, along with ammunition for the submarines’ weapons. In a few hours of mad activity Japanese submariners set about firing off all their torpedoes, and onboard the I-401 the crew catapulted pilotless Seiran bombers off the vessels into the sea. On the I-400 the Japanese sailors punched great holes in the three Seirans floats and then pushed the aircraft overboard. On 28 August, as the three I-400-class submarines closed on Japan they were overtaken by American forces, their colours were struck, and duly replaced with the Stars and Stripes. Taken over by the US Navy, both the I-400 and the I-401 were sailed across the Pacific, ironically to the American west coast they had been designed and built to strike. There the boats were extensively tested, and along with surrendered German U-boats the technologies of their former enemies were integrated into submarine designs for the Cold War. After they had outlived their usefulness the Americans towed the vessels out into the Pacific and scuttled them in 1946. The I-402, the only other completed I-400-class submarine, never undertook a mission to transport fuel to Japan and was also scuttled by the Americans in 1946. When work ceased on the I-404 and I-405, the former submarine was ninety per cent complete. Both vessels were later scrapped where they lay. The only survivor of the I-400-class project is a single Seiran torpedo bomber, discovered by the Americans in the ruins of the Aichi factory in 1945, taken back to the United States for testing and display, and now, after a complete rebuild, displayed at the National Air and Space Museum in Washington DC. In a final footnote to the story, in March 2005 a deep diving submersible from the Hawaii Undersea Research Laboratory located the wreck of the I-401 off Oahu. In the end Fujita’s plan of 1942, to strike against the American mainland, has been recorded in the history books as a mere two feeble aircraft sorties over the great forests of Oregon. The planned Japanese operation for 1945, striking the Gatun Locks at the Panama Canal as Fujita had suggested years before, never went ahead because the Japanese decided to confront the enemy closer to home. Fortunately for everyone concerned, the evil Operation ‘PX’, the biological warfare attack aimed at the western United States, was actually shelved by the Japanese who realized it was a step too far. Would they have been so accommodating if they had known about the American atomic bombs about to be dropped on two of their cities? The war ended just in time to prevent the I-400-class pilots from sallying forth to Ulithi on what would have been one-way missions for all of them. Fujita’s plan cast a long shadow over Japanese submarine operations, but in the end, although the technology was created in time to have made his plan an infinitely more serious proposition than his actual twin attacks in September 1942, circumstances intervened and have left us instead with a series of ‘what if scenarios which the American public fortunately never had to face on their own home ground. This entry was posted in Japan, Naval History by MSW. Bookmark the permalink.